Massasoit and Squanto were apprehensive about the Pilgrims. In Massasoit's first contact with the English, several men of his tribe had been killed in an unprovoked attack by English sailors. He also knew of the Pilgrims' theft of the corn stores and grave robbing. Squanto had been abducted in 1614 by the English explorer Thomas Hunt and had spent five years in Europe, first as a slave for a group of Spanish monks, then in England. He had returned to New England in 1619, acting as a guide to the explorer Capt. Robert Gorges. Massasoit and his men had massacred the crew of the ship and had taken in Squanto. Samoset returned to Plymouth on March 22 with a delegation from Massasoit that included Squanto; Massasoit joined them shortly thereafter. 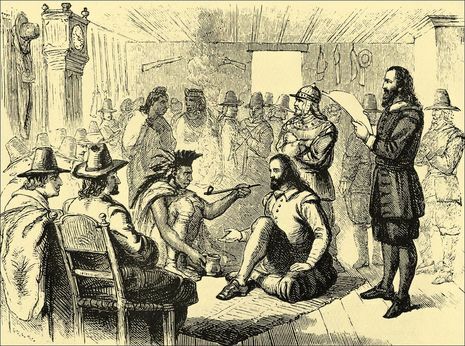 After an exchange of gifts, Massasoit and Governor Martin established a formal treaty of peace. This treaty ensured that each people would not bring harm to the other, that Massasoit would send his allies to make peaceful negotiations with Plymouth, and that they would come to each other's aid in a time of war. Samoset was from an Indian group in Maine, and had picked up a few English words from the fisherman that came into the harbors there. 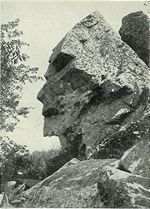 He informed them there was an Indian, Tisquantum, who had been to England and could speak better English than he could. Tisquantum made his first appearance on March 22, at which time he brought Massasoit and Quadequina. The Pilgrims used the opportunity to negotiate a peace treaty and to establish trading relations.